Elegant, sparkling and with a classic touch is what we thought when designing and making this Diamond and Platinum engagement ring. Not shy and full of vigour this piece has its own grace. The lively centre Diamond is beautifully accentuated by its surrounding stones whilst the set shoulders add a further sparkle. 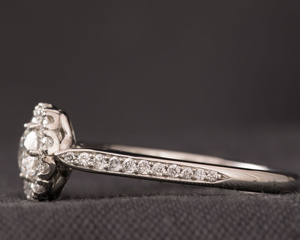 The slender base of the ring will allow you to wear a straight wedding band with it. 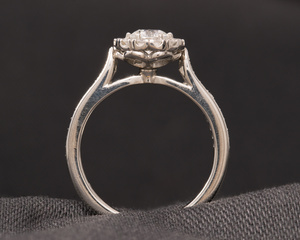 Or should you prefer a gentle curved ring, it would sit equally elegantly next to this engagement ring. It is a versatile design and can be developed to your preference and individual taste. Be it with a colour stone or with varying proportions of size, this piece will always be unique and different, a joy to wear and an object of admiration for years to come. This piece has been sold. 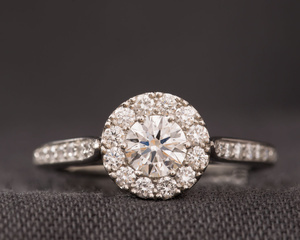 If you would like us to create a new design along the idea seen here, please contact us on 01227788200, or email us at workshop@jewellery-maker.co.uk.